Considering that you may wear your eyeglasses during all or most of your waking hours, it’s important to take your time when choosing a new pair and make sure your eyewear suits the way you look. One of the easiest and most effective ways to do that is to pick out glasses that are appropriate for your face shape. Below, we’ll go over numerous ways you can do that. Like many people, you might not have considered which type of face you have. The next time you take a shower, clear the steam buildup from the bathroom mirror and pull your hair back from your face. Then, take a picture of your reflection in the mirror and use it as guidance while learning about your face shape. Visit a website that shows examples of various face shapes . After checking out that resource, plus studying the picture you took of yourself, it should be easier to determine if you have a heart-shaped face, a round one, or another type. It’s sometimes difficult to have an objective opinion when trying on glasses. Because you’re so accustomed to the way your face looks, you may not notice things that a friend or another person you trust would spot right away. That’s why it’s a good idea to see if a friend will come with you when you go shopping for glasses. Be blunt with the person and simply say, “Does this pair make me look better or worse?” Then, expand on that question by finding out why. The answer the individual gives you may be surprising, but it could be the insight needed to buy a pair of glasses you truly love. When evaluating the different kinds of glasses you try on, it’s also important to see if the shape of the frame gives an accurate perspective of your face. In other words, check to see if your eyes naturally appear in the middle of the frames rather than in an exaggeratedly high or low position. Being aware of your nose shape can also help since the nose pieces of some frames are more appropriate for certain nose structures than others. Ideally, the glasses should stay in place on your nose when you move. If they do that, plus keep your eyes centered in the lenses, you’re on your way to finding a flattering pair. Although it may seem like a counterintuitive tip, people who help individuals choose glasses frames say the most important thing to do is to choose options that are the opposite shape of your face . If you have trouble noticing the difference, start by trying on a pair that matches your face shape, then switch to accessories that contrast with it. The visual differences you see should make it obvious why the contrasting pair is more likely to flatter your face. 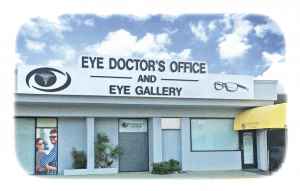 For more help with picking eyeglasses for your face shape, check out The Eye Doctor’s glasses gallery . It’s easier than you may think to find glasses you’ll love to wear.